Have been here numerous times before, and 6 of us last had dinner there on Wednesday. 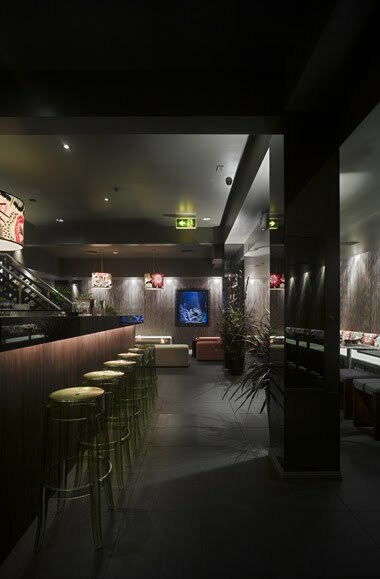 Great Tiki bar downstairs, so is recommended if you have time to have a drink or two down there beforehand – sleek but comfy seating, dim lighting, live tropical fish tank in the wall, stunning, amazing cocktails and other drinks and professional but warm bar service. Restaurant itself is also dimly lit, creating intimate but casual dining, with simple touches such as flowers and marble, and nice interior with plenty of dark wood. Service is friendly and warm, and always happy to explain anything about their dishes. Food is great. Mains are about $20-$32 per dish, so a little more than many Thai restaurants in Sydney but the food is made well with attention to detail. 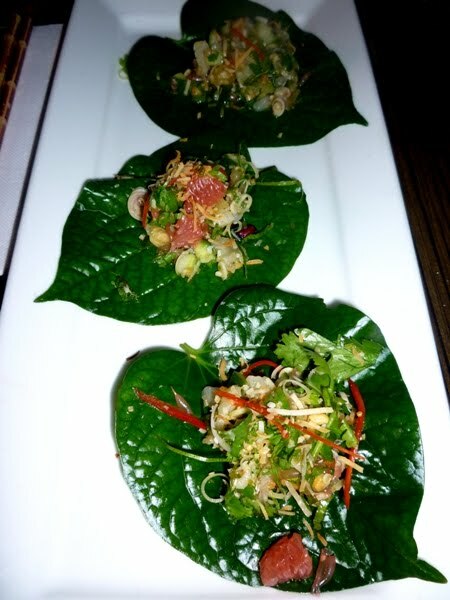 Betel leaves are one of my favourite starters and both of their options – Rambutan miang (betel leaf) w peanut & green nahm jim, and Miang (betel leaf) w smoked trout & grilled chilli eggplant relish – were great. 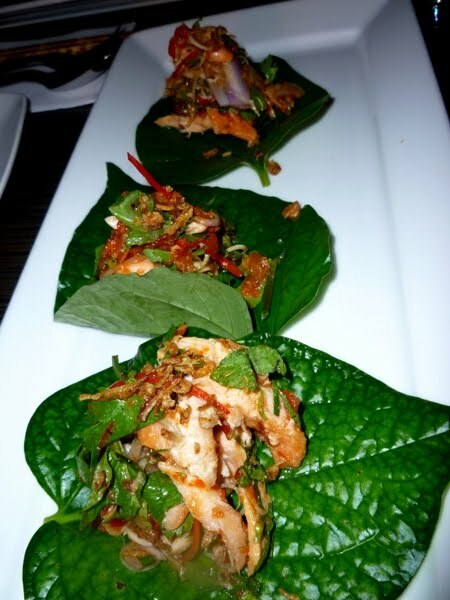 We also has Larb gai of chicken, lemongrass & mint in iceberg cup w spicy dressing & roasted rice – good good. Main dishes all came in good serving sizes. Wagyu beef (Braised wagyu beef w flat noodle Vietnamese mint & black vinegar sauce) was one of the favourite main dishes. I also enjoyed the Wok fried King prawns w pong gari coconut cream baby corn & curry leaf – had just a little kick of spice which I liked. The Stir fried wild mushrooms w ginger, tofu, cashew nut & mushroom soy, and Stir fried roasted pumpkin w egg tofu garlic stems & chilli, both made vegies taste really great. Doytao Thai, Waterloo/Surry Hills – Just at the end of Crown St South, great little takeaway joint (there is some room to eat there), and often packed even though it’s so small. Great cheap tasty thai! Doytao Thai, Newtown – Quite a large restaurant with a solid “eatery” style to it – big long thick wooden tables. Often packed. Atom Thai, Newtown – Have heard good things, haven’t been myself. MOFU (Modern Oriental For U), Neutral Bay – Tucked away from the main road, a nice little modern dim-lit asian restaurant. Nice completely un-pretentious service. Khacha Thai, Spice Lovers Thai, and Bai Yok, all in Crow’s Nest – Good Thai joints. Sailor’s Thai, The Rocks – Tasty Thai but highly priced. We’re lucky in Sydney to have good Thai/Asian fusion available 🙂 Cheers!